This article is about the Pennsylvania city. For other uses, see Johnstown. Johnstown, settled in 1770, has experienced three major floods in its history. The "Great Flood" of May 31, 1889, occurred after the South Fork Dam collapsed 14.1 miles (22.7 km) upstream from the city during heavy rains. At least 2,209 people died as a result of the flood and subsequent fire that raged through the debris. Another major flood occurred in 1936. Despite a pledge by President Franklin Delano Roosevelt to make the city flood free, and subsequent work to do so, another major flood occurred in 1977. The 1977 flood—in what was to have been a "flood free" city—may have contributed to Johnstown's subsequent population decline and inability to attract new residents and businesses. Archaeological evidence shows that the area was inhabited for some 10,000 years. Penn's Woods saw much Native American activity as well as the Quemahoming area. Three distinct tribes (Shawnee, Delaware and Monogahela) migrated, hunted and fished in the area. Johnstown was called Conemaugh Old Town in the native Algonquin language. Old Town was linked to the outlying areas by the Stoney Creek, Quemahoming Creek and Conemuagh Rivers joining Johnstown to older settlements on the river including New Florence (Squirrel Hill), Quemahoming and Kickenapaulin's (near Hooversville). Johnstown was formally organized as a town in 1800 by the Swiss German immigrant Joseph Johns (born Josef Schantz). The settlement was initially known as "Schantzstadt", but was soon anglicized to Johnstown. From 1834 to 1854, the city was a port and key transfer point along the Pennsylvania Main Line Canal. Johnstown was at the head of the canal's western branch, with canal boats having been transported over the mountains via the Allegheny Portage Railroad and refloated here, to continue the trip by water to Pittsburgh and the Ohio Valley. Perhaps the most famous passenger who traveled via the canal to visit Johnstown briefly was Charles Dickens in 1842. By 1854, canal transport became redundant with the completion of the Pennsylvania Railroad, which now spanned the state. With the coming of the railroads, the city's growth improved. Johnstown became a stop on the main line of the Pennsylvania Railroad and was connected with the Baltimore & Ohio. The railroads provided large-scale development of the region's mineral wealth. Iron, coal, and steel quickly became central to the town of Johnstown. By 1860, the Cambria Iron Company of Johnstown was the leading steel producer in the United States, outproducing steel giants in Pittsburgh and Cleveland. Through the second half of the 19th century, Johnstown made much of the nation's barbed wire. Johnstown prospered from skyrocketing demand in the western United States for barbed wire. 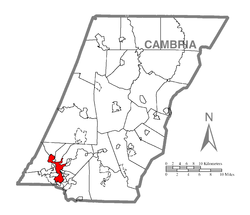 Twenty years after its founding, the Cambria Works was a huge enterprise sprawling over 60 acres (240,000 m2) in Johnstown and employing 7,000. It owned 40,000 acres (160 km2) of valuable mineral lands in a region with a ready supply of iron, coal and limestone. In the early 20th century, the population reached 75,000 people. The city's first commercial radio station, WJAC, began broadcasts in 1925. The downtown boasted at least five major department stores, including Glosser Brothers, which in the 1950s gave birth to the Gee Bee chain of department stores. However, the St Patrick's Day flood of 1936 combined with the gnawing effects of the Great Depression left Johnstown struggling again, but only temporarily. Johnstown's citizens mobilized to achieve a permanent solution to the flooding problem and wrote to President Franklin Roosevelt pleading for federal aid. Starting in August 1938, continuing for the next five years, the U. S. Army Corps of Engineers gouged, widened, deepened, and realigned 9.2 miles (14.8 km) of river channel in the city, and encased the river banks in concrete and reinforced steel. In a campaign organized by the Chamber of Commerce, thousands of Johnstown's citizens wrote to friends and relatives across the country hoping to bring new business to the town. Professional ice hockey would find a home in Johnstown, starting in 1941 with the Johnstown Blue Birds for one season and returning in 1950 with the Johnstown Jets. The Jets later hosted an exhibition game against Maurice Richard and the Montreal Canadiens on November 20, 1951. The memory of floods was virtually purged from the community's consciousness. Newcomers to the town heard little about the tragic past. Johnstown proclaimed itself "flood-free", a feeling reinforced when Johnstown was virtually the only riverside city in Pennsylvania not to flood during Hurricane Agnes in 1972. The immediate post-World War II years mark Johnstown's peak as a steel maker and fabricator. At its peak, steel provided Johnstowners with more than 13,000 full-time, well-paying jobs. However, increased domestic and foreign competition, coupled with Johnstown's relative distance from its primary iron ore source in the western Great Lakes, led to a steady decline in profitability. New capital investment waned. Johnstown's mountainous terrain, and the resulting poor layout for the mills' physical plant strung along 11 miles (18 km) of river bottom lands, compounded the problem. New regulations ordered by the EPA in the 1970s also hit Johnstown, with the aging Cambria plant (now Bethlehem Steel) especially hard. However, with encouragement from the steel company, the city fathers organized an association called Johnstown Area Regional Industries (JARI) and, within a year, raised $3 million for industrial development in the area. Bethlehem Steel, which was the major contributor to the fund, committed itself to bringing new steelmaking technologies to Johnstown because they were impressed by the city's own efforts to diversify. Extensive damage from the 1977 flood was heavy and there was talk of the company pulling out. Again, the city won a reprieve from the company's top management, which had always regarded the Johnstown works with special affection because of its history and reputation. As the increasing amount of federal environmental regulations became more difficult to comply with and the issues with the aging manufacturing facilities grew more significant, and as steel companies began closing down plants all over the country, by 1982 it looked as if Johnstown had exhausted its appeals. By the early 1990s, Johnstown abandoned most of its steel production, although some limited fabrication work continues. The University of Pittsburgh at Johnstown and Pennsylvania Highlands Community College attract thousands of students to their contiguous campuses in Richland, 5 miles (8 km) east of Johnstown. Cambria-Rowe Business College, located in the Moxham section of Johnstown, offers concentrated career training and has continuously served Johnstown since 1891. The Pasquerilla Performing Arts Center, a concert/theatrical venue at the University of Pittsburgh at Johnstown, attracts high-quality performers. The Johnstown Symphony Orchestra and the recently formed Johnstown Symphony Chamber Players provide classical music. The Johnstown Concert Ballet, centered in the Historic Cambria City District, provides classical ballet performances and training to the area. The Pasquerilla Convention Center was recently constructed downtown, adjacent to the historic Cambria County War Memorial Arena at 326 Napoleon Street. Point Stadium, a baseball park where Babe Ruth once played, was razed and rebuilt. A zoning ordinance created an artist zone and a traditional neighborhood zone to encourage both artistic endeavors and the old-fashioned "Mom and Pop" enterprises that had difficulty thriving under the previous code. The Bottleworks Ethnic Arts Center offers many exhibitions, events, performances, and classes that celebrate the rich and diverse cultural heritage of the area. The Johnstown Chiefs ice hockey team played for 22 seasons, the longest period a franchise of the league stayed in one city. The Chiefs were a member team of the ECHL, and played their home games in the Cambria County War Memorial Arena. The Chiefs' decision to relocate caused a flood of public interest in the sport of hockey. As many as four leagues were interested in having a team in the War Memorial. In the end the city landed a deal with another ECHL team, the Wheeling Nailers, who played parts of two seasons at the War Memorial. A full-time tenant arrived in 2012, when the Johnstown Tomahawks of the junior North American Hockey League began play. The recently established ART WORKS in Johnstown! houses artist studios in some of the area's architecturally significant but underused industrial buildings. The ART WORKS in Johnstown project is projected to be a non-profit LEED-certified green building. The Frank & Sylvia Pasquerilla Heritage Discovery Center opened in 2001 with the permanent exhibit "America: Through Immigrant Eyes", which tells the story of immigration to the area during the Industrial Revolution. In June 2009, the Heritage Discovery Center opened the Johnstown Children's Museum and premiered "The Mystery of Steel", a film detailing the history of steel in Johnstown. The Bottleworks Ethnic Arts Center, ART WORKS, and the Heritage Discovery Center are located in the historic Cambria City section of town, which boasts a variety of eastern European ethnic churches and social halls. This neighborhood hosted the National Folk Festival for three years in the early 1990s, which expanded into the Flood City Music Festival. Johnstown also hosts the annual Thunder in the Valley motorcycle rally during the fourth week of June; the event has attracted motorcyclists from across the Northeast to the city of Johnstown since 1998. Well over 200,000 participants enjoyed the 2008 edition of Thunder in the Valley, and the event continues to grow in size. In 2019, Johnstown was named the poorest town in Pennsylvania . On May 2, 2015, Johnstown was announced as the winner of the 2015 Kraft Hockeyville USA contest and was awarded $150,000 toward improvements of the Cambria County War Memorial Arena. The contest was sponsored through a partnership between Kraft Foods, the National Hockey League (NHL), and National Hockey League Player's Association (NHLPA). In addition to the cash prize, the arena won the opportunity to host the September 29, 2015, NHL pre-season game between the Pittsburgh Penguins and Tampa Bay Lightning. According to the United States Census Bureau, the city has a total area of 6.1 square miles (15.8 km2), of which 5.9 square miles (15.3 km2) is land and 0.19 square miles (0.5 km2), or 3.25%, is water. The Conemaugh River forms at Johnstown at the confluence of its tributaries, the Stonycreek River and the Little Conemaugh. The city of Johnstown is divided into many neighborhoods, each with its own unique, ethnic feel. These include the Downtown Business District, Kernville, Hornerstown, Roxbury, Old Conemaugh Borough, Prospect, Woodvale, Minersville, Cambria City, Morrellville, Oakhurst, Coopersdale, Walnut Grove, Moxham and the 8th Ward. Richland Township, Geistown, Lorain and Stonycreek Township. East Conemaugh, Franklin, Daisytown, Conemaugh Township, as well as West Taylor, Middle Taylor, and East Taylor townships. South Fork, Salix, Beaverdale, Sidman, St. Michael, Dunlo, Wilmore, Portage, Ehrenfeld, and Summerhill. The Bruce Springsteen song "The River" mentions the Johnstown Company: "I got a job working construction, for the Johnstown Company, but lately there ain't been much work, on account of the economy." " Highway Patrolman", another Springsteen song, has the lyrics "as the band played 'Night of the Johnstown Flood.'" The 1977 film Slap Shot, directed by George Roy Hill and starring Paul Newman, was a parody loosely based on the real-life Johnstown Jets ice hockey team and its North American Hockey League championship in 1976. In the movie, Johnstown was rechristened "Charlestown" and the Jets as the Charlestown Chiefs. The film's premiere engendered some local controversy, as some thought Johnstown was portrayed in a less than flattering light. Slap Shot has since become the iconic movie about hockey and its foibles. Screenwriter Nancy Dowd would revive the fake town of "Charlestown" in her screenplay for the 1981 punk rock satire Ladies and Gentlemen, The Fabulous Stains, but the film itself was shot in Canada. All the Right Moves, a high school football drama set in the fictional town of Ampipe and featuring Tom Cruise, Lea Thompson and Craig T. Nelson, was filmed in the area. Locations seen in the movie are the old Johnstown High School in the Kernville neighborhood, torn down shortly afterwards; the Carpatho-Russian Citizen's Club in East Conemaugh; the Franklin works of Bethlehem Steel; the Point Stadium; the Johnstown "Cochran" Junior High football practice field and the Johnstown Vo-Tech football locker room. The Johnstown Flood, written and directed by Charles Guggenheim, won the Academy Award for Best Documentary, Short Subject in 1989. The film was commissioned by the Johnstown Flood Museum Association, which later reorganized as the Johnstown Area Heritage Association, and is shown every hour at the Johnstown Flood Museum. Mystery novel writer K. C. Constantine fictionalized many elements of Johnstown and its culture as "Rocksburg" in his novels, although the nearby city of Greensburg also provides some of the lore for Rocksburg. In 2000, Kathleen Cambor published In Sunlight, In A Beautiful Garden. The novel followed its characters through the events leading up to and including the 1889 flood. Although the protagonists in the novel were fictional, several historical figures, such as Andrew Mellon, Henry Clay Frick and Daniel Morrell were also depicted in the book. Author James Patterson had his fictional serial kidnapper, Gary Soneji, from Along Came a Spider stop at a convenience store on his way through Johnstown. Author David Morrell had his fictional character "Eliot" recruit two brothers from an orphanage in Johnstown to train as assassins in The Brotherhood of the Rose. In the 1978 film Dawn of the Dead, a character mentions that they are flying over Johnstown, Pennsylvania, and quips that the people are actually entertained by the zombie outbreak. George A. Romero filmed the majority of the zombie movie at the Monroeville Mall, some 50-odd miles away. Johnstown is featured in Defenders of Freedom Volume 1 (2010) and Defenders of Freedom Volume 2 (2012). Both are hardcover books, published by the Williamsport Sun-Gazette, featuring first person stories of Lycoming County, Pennsylvania, military veterans who served in World War II, Korea and Vietnam. In the foreword of each volume, Johnstown native and nationally recognized newspaper publisher Bernard A. Oravec shares stories of his father's military police service in Germany and growing up in Johnstown's west end during the 1970s. Author and Johnstown native Robert T. Jeschonek wrote a nonfiction history of the local landmark Glosser Bros. Department Store and its multimillion-dollar parent company in his 2014 book Long Live Glosser's. Jeschonek also depicted a fictional 1975 tour of the Glosser Brothers Department Store in his 2013 novelette Christmas at Glosser's. Johnstown is the setting of Jeschonek's story Fear of Rain, which was nominated for a British Fantasy Award. His mystery novels Death by Polka and The Masked Family are also set in and around Johnstown. The two high schools located in the city of Johnstown are Greater Johnstown High School and Bishop McCort High School. The Cambria County Library is located at 248 Main Street. Our Town Johnstown – "Johnstown's Community Newspaper"
WFRJ 88.9 Religious Johnstown Family Stations, Inc.
WPCL 97.3 Religious Northern Cambria He's Alive, Inc.
WKHB 620 Oldies Irwin Broadcast Communications, Inc.
Johnstown's television market is part of the Johnstown/ Altoona/ State College market. NBC affiliate WJAC-TV 6 and Fox affiliate WWCP-TV 8 are licensed in the city. Johnstown is also served by CBS affiliate WTAJ-TV 10 and ABC affiliate WATM-TV 23, both based in Altoona, and State College-based PBS member station WPSU-TV 3, licensed to Clearfield but based on the Pennsylvania State University campus. WPCW 19, The CW's owned-and-operated station in Pittsburgh licensed to Jeannette (and was itself once licensed in Johnstown), serves as the market's default CW affiliate. Several other low-power stations, including WHVL-LP 29 ( MyNetworkTV) in State College, also transmit to Johnstown. The main highway connecting Johnstown to the Pennsylvania Turnpike is U.S. Route 219. There is also State Route 56, which is an expressway from 219 until Walnut Street. From there, it provides a connection to U.S. Route 22 to the north of Johnstown, which connects to Pittsburgh and Altoona. The local airport is the John Murtha Johnstown-Cambria County Airport and is served by Southern Airways Express. Passenger rail service is provided by Amtrak's daily ' Pennsylvanian'. The city is located on the former mainline of the Pennsylvania Railroad. Norfolk Southern operates 60-80 trains daily on these rails. CSX also has a branch into the city. Johnstown has been home to a long succession of minor league hockey franchises dating back to 1940. One of the more recent manifestations, the Johnstown Chiefs, were named for their Slap Shot counterparts. The team made their ECHL debut in 1988. The team announced in February 2010 that they would be leaving Johnstown for a location in South Carolina. In April 2010 it was announced that the Wheeling Nailers of the ECHL would call Johnstown home for 10 games during the regular season and for one of their preseason games. They returned once again for the 2011-12 season. After the 2011-2012 NAHL hockey season, the Alaska Avalanche relocated to Johnstown and became the Johnstown Tomahawks and have remained in Johnstown ever since. The city also has history in amateur and professional baseball. Since 1944, Johnstown has been the host city for the AAABA Baseball Tournament held each summer. Several Major League Baseball players have played on AAABA teams over the years, including Hall-of Famers Al Kaline and Reggie Jackson and current Major League managers Joe Torre and Bruce Bochy. The organization also has its own Hall of Fame instituted in its 50th anniversary year of 1994. In addition, the city has hosted several incarnations of a Minor League Baseball team, the Johnstown Johnnies, beginning in 1884. The last team to play as the Johnnies, as a part of the Frontier League, left the city in 2002. Johnstown also hosts the annual Sunnehanna Amateur golf tournament at its Sunnehanna Country Club. The invitational tournament hosts top amateur golfers from around the United States. Johnstown is home to the Flood City Water Polo team. Established in 2005 by Zachary Puhala, the team takes its name from the history of floods in the area. FCWP is part of the American Water Polo Organization. Cambria Iron Company is a National Historic Landmark located near the downtown area. Johnstown's city seal has an image of this facility. Famous Coney Island Hot Dogs – Founded in 1916, this eatery is synonymous with Johnstown culture. Frank & Sylvia Pasquerilla Heritage Discovery Center – includes several attractions: "America: Through Immigrant Eyes," a permanent exhibit about immigration to the area around the turn of the 20th century; the Johnstown Children's Museum, a 7,000-square-foot (650 m2) children's museum; and the Iron & Steel Gallery, a 3-story gallery that includes "The Mystery of Steel," a film about the history of steel in Johnstown. Grandview Cemetery, Johnstown is one of Pennsylvania's largest cemeteries: With more than 65,000 interments, Grandview is home to over 47 burial sections and more than 235 acres (0.95 km2) of land. Grandview also holds the remains of the 777 victims of the 1889 Johnstown Flood who were not able to be identified. Johnstown Flood National Memorial – the National Park Service site that preserves the remains of the South Fork Dam and portions of the Lake Conemaugh bed. The Johnstown Flood Museum – shows the Academy Award-winning film "The Johnstown Flood" as part of the museum experience. Johnstown Inclined Plane is the world's steepest vehicular inclined plane. Silver Drive-In – first opened in 1962. While other such facilities in the area have closed over the course of years, the Silver survived through public outcry over proposals to close and demolish it, making a comeback in 2005. Located in Richland Township, it is now the only drive-in theater in the Johnstown, Pennsylvania region. Staple Bend Tunnel is the first railroad tunnel constructed in the United States, and a National Historic Landmark. Stone Bridge is a historic railroad bridge over the Conemaugh River. Victor Heiser (1873-1972), The Great Flood of 1889 survivor, physician, and author. Russell Shorto, author of "Island at the Center of the World" and "Descartes Bones"
Ehrenfeld, Pennsylvania, Nanty Glo, Pennsylvania, and Windber, Pennsylvania, nearby communities with notable "Johnstowners"
Karl Berger, M.D., editor. Johnstown: Story of a Unique Valley, published by the Johnstown Flood Museum, 1984. ^ "City Council | City of Johnstown PA". ^ "City of Johnstown". Geographic Names Information System. United States Geological Survey. Retrieved October 20, 2010. ^ "Geographic Identifiers: 2010 Demographic Profile Data (G001): Johnstown city, Pennsylvania". U.S. Census Bureau, American Factfinder. Retrieved March 10, 2015. ^ "Annual Estimates of the Resident Population: April 1, 2010 to December 1, 2017 (PEPANNRES): Incorporated Places, Pennsylvania". U.S. Census Bureau, American Factfinder. Retrieved May 10, 2018. ^ U.S. Census Bureau. "American FactFinder - Results". factfinder2.census.gov. Retrieved May 10, 2018. ^ Berger, Karl (1985). Johnstown, the Story of a Unique Valley. Johnstown Flood Museum. ASIN B0012MLSC4. ^ "Conemaugh Memorial". Health Grades. Health Grades. ^ "Monthly Averages for Johnstown, PA". Accuweather.com. 2012. Retrieved July 5, 2009. ^ "Annual Estimates of the Resident Population: April 1, 2010 to July 1, 2013". Archived from the original on May 22, 2014. Retrieved June 27, 2014. ^ "1940 Census - Census of Population and Housing - U.S. Census Bureau". Census.gov. Archived from the original on March 27, 2010. Retrieved July 26, 2012. ^ "1960 Census of Population and Housing". Census.gov. Archived from the original on May 5, 2010. Retrieved July 26, 2012. ^ "1990 Census of Population and Housing Unit Counts" (PDF). Census.gov. Retrieved September 18, 2017. ^ a b c "Profile of General Population and Housing Characteristics: 2010 Demographic Profile Data (DP-1): Johnstown city, Pennsylvania". U.S. Census Bureau, American Factfinder. Retrieved March 10, 2015. ^ "Selected Social Characteristics in the United States: 2008-2010 American Community Survey 3-Year Estimates (DP02): Johnstown city, Pennsylvania". U.S. Census Bureau, American Factfinder. Retrieved March 10, 2015. ^ "Selected Economic Characteristics: 2011-2013 American Community Survey 3-Year Estimates (DP03): Johnstown city, Pennsylvania". U.S. Census Bureau, American Factfinder. Retrieved March 10, 2015. ^ Sebree, Mac; and Ward, Paul (1974). The Trolley Coach in North America, pp. 155–158. Los Angeles: Interurbans. LCCN 74-20367. ^ "Sunnehanna Amateur". Retrieved March 20, 2018. ^ "PA Junior High Wrestling". Retrieved March 23, 2018. ^ "Johnstown PA, Crime Rates". Neighborhood Scout. Location Inc. Retrieved March 23, 2018. ^ "CIty of Johnstown". Johnstown PA. Precision Business Sloutions. Retrieved April 5, 2018. ^ "Police". Johnstown PA. Precision Business Solutions. Retrieved April 5, 2018. ^ "City of Johnstown". Precision Business Solutions. Retrieved April 5, 2018. ^ "Mayor Frank Janakovic". Retrieved April 5, 2018. ^ Faher, Mike (August 19, 2011). "Former mayor Pfuhl dies". The Tribune-Democrat. Retrieved August 22, 2011. ^ "Christmas at Glosser's Exclusive Special Edition - Pie Press Publishing". Piepresspublishing.com. April 29, 2014. Archived from the original on April 29, 2014. Retrieved September 18, 2017. ^ Morawska, Ewa (September 18, 2017). "For Bread with Butter: The Life-Worlds of East Central Europeans in Johnstown, Pennsylvania, 1890-1940". Cambridge University Press. Retrieved September 18, 2017 – via Google Books. ^ Morawska, Ewa (September 18, 1999). "Insecure Prosperity - Small-Town Jews in Industrial America, 1890-1940". Princeton University Press. Retrieved September 18, 2017 – via Google Books. Wikimedia Commons has media related to Johnstown, Pennsylvania.